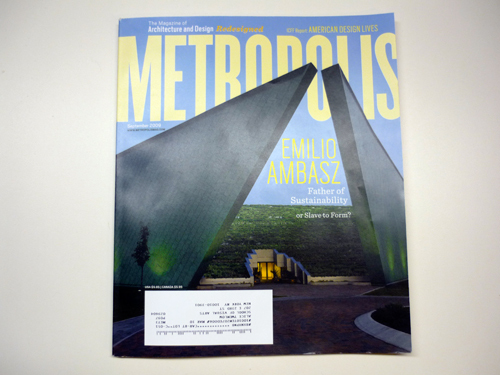 The printed version of Metropolis magazine has shrunk as of last September. The result of a publishing crisis-induced redesign (in corner-cutting times, every inch counts), the magazine’s new size did not resolve its two other most pressing ills: an unclear international ambition and an art direction that doesn’t seem to know its place. Under the title “What is Good Design now?”, the March 2009 issue was one of the magazine’s best yet. The collection of essays from writers such as Deyan Sudjic, Peter Hall, John Hockenberry, Bruce Sterling, Niels Diffrient and Karrie Jacobs made it worth reading, not to mention contributions from the magazine’s editors and writers. This issue showed how Metropolis could instigate a broad, timely debate over the state of design six months after the global financial crisis started. It was an example of how a magazine can influence law makers, inspire professionals and educators, nurture students. It was also a good initiation on what design is for the common man. It was something you save from the bookshelf in case of a fire. Regardless of its content, this issue was also the epitome of Metropolis’ growing graphic mess. From Gail Anderson’s crazy busy cover to the magazine’s interior spreads, it seemed there were no graphic gimmicks left unused, no visual tricks left in the bag. There were tons of illustrations, color bars everywhere, oversized photos, (Philippe Starck’s Juicy Salif coming out of the page!). There is hardly any publication that does not go through a slow and destructive process when it comes to its design; like anything else on Earth, magazines—but also newspapers and websites—are also victims of entropy. By this issue there was hardly anything left of Paula Scher’s design, apart from the Bodoni Book typeface used in most of its text. Until last month. 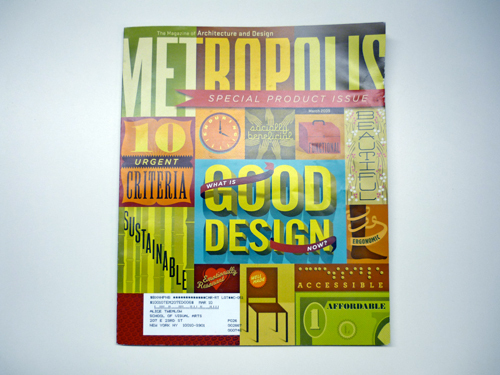 March 2009 was also the month Metropolis started calling itself “The Magazine of Architecture and Design”, a title it has carried through the September redesign. A rather pompous, if ambiguous title at that: is it New York’s, USA’s, the World’s magazine? Where does this ambition or quest for authority come from? Despite covering subjects from all over the world, there is an undoubtedly American (not to say New York-centric) tone to Metropolis. 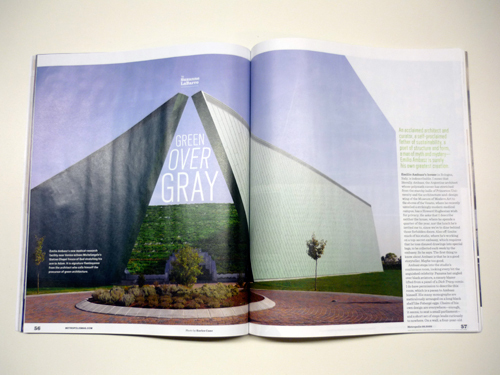 A clear example of that is Suzanne LaBarre’s (excellent) cover article on Emilio Ambasz, where one reads: “The green-building movement has enjoyed a meteoric rise, evidenced by government subsidies and LEED’s dizzy growth, but it lost an art component around the time green ceased to be a color and instead became a metaphor.” LEED, an US environmental standard for buildings, is not contextualized in a piece about an Argentinian architect and his most recent building in Italy. So what is Metropolis talking about, or talking to? Also, in her September editorial editor-in-chief Susan Szenasy’s mentions the several virtues of the redesign, which include increased white space and an integrated approach to sidebar design. She says, “We think it works particularly well with this [Ambasz] piece, which goes deeply into the reclusive designer’s poetic aesthetics. You’ll also note that the outside margins—the seventh column—are sometimes used for factoids related to the story.” In the case of this article, some of the factoids include thumbnail photos of 1960s Italian furniture, whose connection to the story is esoteric at best. Emilio Ambasz story. Why the chair and the lamp? 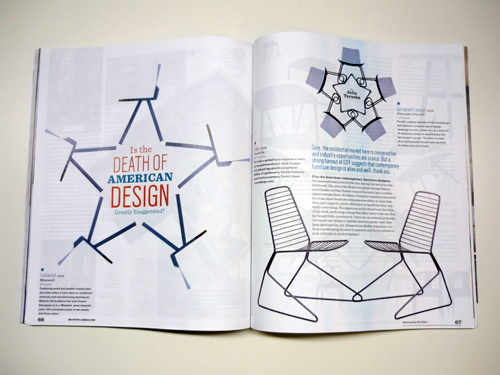 The star-studded death of American Design. I have to say I’m a big fan of Metropolis. I was a subscriber for several years, and am a frequent reader of its insightful writing, highly researched features on iconic designers and architects, not to mention Karrie Jacob’s excellent America column. I acknowledge its role as a champion of sustainable architecture and design practices, and find it a great source to understand American design. But Metropolis is not an international magazine; it’s not made by an international team, and is not even aimed at an international readership. That is made clear also by the magazine’s advertising, largely made up of ads for American contract furniture and lighting companies and other architectural suppliers. These ads, (in their vast majority, far from attractive), which the magazine’s publishers have not been able to deter advertisers from placing on most desirable, right-hand pages, make for a choppy reading, made worse in the front of the magazine as editorial content shares space with half-page ads. But then again, you don’t even need to buy Metropolis and be troubled by its printed advertising. 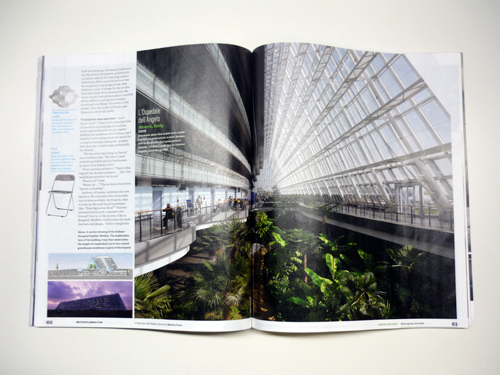 You can find both full articles and ugly ads online at metropolismag.com. The magazine’s website, where virtually the whole issue’s contents can be found, read and shared, offers little else than the visual chaos of its printed version. All in all, the renewed (not new) Metropolis is an improvement. Julie Taraska, one of the magazine’s contributors, summed it up nicely on a recent tweet: “Metropolis magazine’s redesign: Small trim size, clearer font, more white space, fits better in the tote bag.” But despite the therapeutic nature of its redesign it still seems to be suffering from chronic grandness and horror vacui. Publishing may be a tight business these days, but we all can use a little more space to breathe and think. If less paper and more white space prove to be good for Metropolis, further constraint and humility can be a lot better.